To Cite: Khodayari Zarnaq R, Saadati M , Rezapour R, Baghaie H. Epidemiology of Injuries in Children Younger Than Five Years Old - Tabriz, J Compr Ped. 2018 ; 9(4):e62092. doi: 10.5812/compreped.62092. Background: Childhood injuries are among the main reasons of children referring to hospital’s emergency department and were introduced as the most common cause of child disability and death. The aim of this study was to investigate the epidemiology of injuries in younger than five years old children, admitted to Tabriz Shohada Hospital emergency ward, since year 2015. Methods: In a cross-sectional study, all children under five years old, admitted to Tabriz Shohada Hospital emergency department, due to trauma, since 2015, were selected, as the study population (n = 1376). Required data included gender, age, length of hospital stay, type of accidents, injury type, the injured body part, and type of insurance. Data were gathered using hospital information systems as well as medical records, through a researcher-made goal driven form. Data were analyzed using the SPSS 24 software, and Pearson Chi-square test and Phi and Cramer's V.
Results: The highest number of accidents was related to males (59.4%), and child at age four (41.1%). Most common type of insurance was social security insurance (50.3%). Falling, with a frequency of 44.3%, was the most prevalent accident and the most frequent injuries were fractures (66.9%). Forearm was the most injured anatomic part of the body (22.7%). There was a significant relationship between children’s age and season of the accidents, and also between the child’s gender and injury types (P < 0.05). Conclusions: Mothers should be trained on fall prevention strategies, especially when the child starts to walk and play. Moreover, safety rules must be employed in settings used by children, such as playgrounds and parks. This was a cross-sectional study conducted at Tabriz Shohada Hospital, during year 2016. The study population was all children under five years old (1376 cases), referring to the emergency department of Tabriz Shohada Hospital, since 2015, due to injury. All cases were recruited as the study sample. A researcher-made goal-driven data collection form was developed for data gathering, including the child’s gender, age, length of stay at the hospital, type of accident, injury type, anatomical location of the injury, and type of insurance. Data were extracted from the hospital health information system (HIS). Information about the patients, which were not registered at the HIS, were extracted through patients’ medical records. Shohada Hospital is a teaching hospital and the largest orthopedic hospital and trauma referral center in the North West of Iran, and has 265 beds. The SPSS version 24 software was used for data analysis. Descriptive statistics (frequency, mean, etc.) were used to describe the prevalence of accidents and injuries, the time pattern of accidents and frequency of injured anatomical sites and demographics. Moreover, Pearson’s Chi-square and Phi and Cramer's V tests were used to investigate the relationship between the variables of gender, accident type, injury type, time of the accident, and age. This study was approved by the Ethics Committee of Tabriz University of Medical Sciences. The results showed that accidents most commonly occurred in children aged four years old (41.1%) and least commonly (0.3 %) in children less than one year old. Most injuries were in males (59.4%). More than half of the referred children (50.3%) used social security insurance. Mean length of stay was calculated as 3.08 days, ranging from one to 49 days. According to the results, it was determined that falling had the most incidence frequency (44.3%). According to the Chi-square test results, there was no significant difference in the frequency distribution of accidents in different genders (P value = 0.090). Frequency distribution, related to all kinds of accidents in children, are shown in Figure 1 (classification codes based on ICD-10, recorded in the hospital information system). It was revealed that fractures were the most frequent (66.9%) injuries in children. Bone cyst (0.3%) and nerve damage (0.7%) were injuries with the lowest frequency. Investigating the relationship between child’s gender and injury type showed no significant difference in terms of frequency distribution (P value < 0.01, Cramer's V = 0.19) (P value < 0.05). The relative frequency distributions of injuries regarding child gender are presented in Figure 2. In terms of seasons, a significant difference was observed in the distribution of accidents in different seasons (P value = 0.01, Cramer's V = 0.135) and falling had the highest frequency in all seasons. 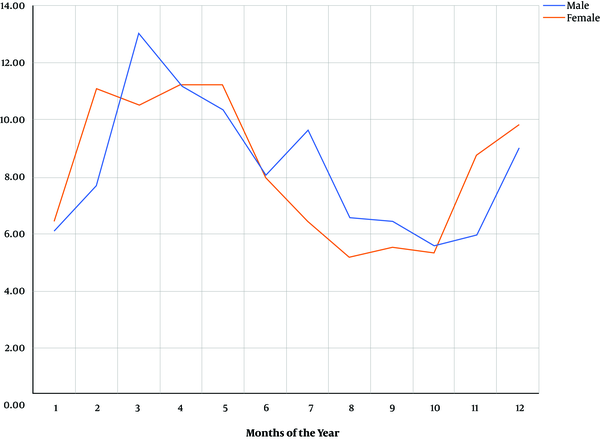 Moreover, the results showed that most accidents occurred during summer with relative frequency of 30.08%. The relative frequency distribution of the time pattern of accidents, according the child gender, is shown in Figure 3. Based on the results, it was determined that the most injured anatomical location was the forearm with relative frequency of 22.7% (Figure 4). There was a significant relationship between the child’s age and accident type (P value < 0.05) (P value < 0.01, Cramer's V = 0.173). In this regard, most accidents occurred in children aged four and five years old, with relative frequency of 41.3% and 37.4% (Figure 5). The results showed that falling (44.3%), unspecified inanimate mechanical forces (10.4%), and traffic accidents (8.8%), respectively, were the most frequent accidents that occurred in under five-year-old children referring to the Shohad Hospital. 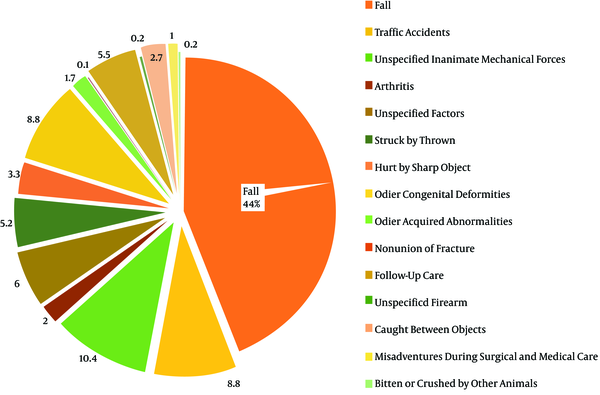 Bone fracture (66.9%) and wound (9.9%) were the most frequent consequence of accidents. The forearm was the most injured anatomic location in children. Moreover, seasonal distribution revealed that most accidents occurred during summer (30.08%). Most accidents were related to males (59%), which was consistent with the results of other studies in Iran (16, 18, 20, 21), as well as with similar studies in other countries (22-25). This could be due to the different pattern of the boy’s entertainments and behavior, which puts them at greater risk of injuries. The results showed that most accidents (30.08%) occurred in the summer. This was consistent with the findings of Dolatabadi et al. (30.9%) (16) and Asadi et al. (36%) (20). It could be suggested that more accidents in summer might be due to the greater presence of children in playgrounds, such as parks, and performing risky behaviors. Moreover, the growing number of trips and presence of families in parks and public spaces, during summer, increases the risk of accidents and also traffic collisions incidence. Equipping the playgrounds with safety equipment and improving public places safety could be useful in preventing child injuries. However, adoption of safety rules in homes will be effective. Falling (44.3%) was the most frequent accident, followed by the unspecified inanimate mechanical forces (10.4%), and traffic accidents (8.8%). Similarly, falling was reported as the most frequent accident (40.4%), followed by traffic accident (35.1%) in another study from Iran (20). However, in a study by Dolatabadi et al. (16), most of the accidents were traffic accidents (52.3%) and then falls (41.5%). Stroke and falling was reported by Mobasheri et al. (18), as accidents with high incidence frequency in children. In a study from western Iran, it was demonstrated that falling and traffic accidents were the most frequent accidents in children under six years old (26). Moreover, Lawoyin et al. (27) and Ganveer and Tiwari (17) reported falling as the most common accident in children. It should be noted that the mean age of children in this study was 4.14 ± 0.78 and was relatively different from other studies, ranging from 2.5 to 6.6. The differences in the incidence frequency of various accidents in the mentioned studies could be caused by differences in the mean age of the study population. However, the study context could affect the results. In this study, the most injured anatomic sites were the forearm (22.7%) and arms (19.9%), respectively. These results were not consistent with previous studies. Head and neck (39.7%), and then the lower limbs (32.7%) were reported as the most injured sites by Dolatabadi et al. in children (16). A study by Asadi et al. had reported head and neck (71.2%) and extremities injuries (15.5%) with highest frequency (20). Differences in the injured anatomic sites, reported in these studies, could be due to differences in the prevalence of accidents in this study with previous studies. It was revealed that most accidents had occurred in children at age four, and falling had the highest frequency. In this regard, fall prevention strategies must be trained for parents, especially when children start to walk and play. However, they must receive first aid education to decrease trauma injuries. Moreover, safety rules and equipment must be employed by municipalities in settings used by children, as a leisure place. Extracted data was based on hospital information system and medical records. Moreover, data was not recorded completely in some medical records. The authors would like to thank Shohada Hospital authorities for their contribution. Authors’ Contribution: Study concept and design: Rahim Khodayari Zarnaq, Mohammad Saadati, and Ramin Rezapour; acquisition of data: Mohammad Saadati and Hamed Baghaie; analysis and interpretation of data: Ramin Rezapour and Mohammad Saadati; drafting of the manuscript: Ramin Rezapour and Mohammad Saadati; critical revision of the manuscript for important intellectual content: Rahim Khodayari Zarnaq and Mohammad Saadati; study supervision: Rahim Khodayari Zarnaq and Mohammad Saadati. Conflict of Interests: The authors declare no potential conflict of interests. Funding/Support: This study was conducted with support of the Road Traffic Injury Research Center. 1. Nantulya VM, Reich MR. The neglected epidemic: Road traffic injuries in developing countries. BMJ. 2002;324(7346):1139-41. doi: 10.1136/bmj.324.7346.1139. [PubMed: 12003888]. [PubMed Central: PMC1123095]. 2. Hardelid P, Davey J, Dattani N, Gilbert R; Working Group of the Research and Policy Directorate of the Royal College of Paediatrics and Child Health, et al. Child deaths due to injury in the four UK countries: A time trends study from 1980 to 2010. PLoS One. 2013;8(7). e68323. doi: 10.1371/journal.pone.0068323. [PubMed: 23874585]. [PubMed Central: PMC3707924]. 3. Sridharan L, Crandall M. Injury and health among children in vulnerable families. J Trauma. 2011;70(6):1539-45. doi: 10.1097/TA.0b013e3182190b94. [PubMed: 21817990]. 4. Jagnoor J, Suraweera W, Keay L, Ivers RQ, Thakur J, Jha P, et al. Unintentional injury mortality in India, 2005: Nationally representative mortality survey of 1.1 million homes. BMC Public Health. 2012;12:487. doi: 10.1186/1471-2458-12-487. [PubMed: 22741813]. [PubMed Central: PMC3532420]. 5. Fraga AM, Fraga GP, Stanley C, Costantini TW, Coimbra R. Children at danger: Injury fatalities among children in San Diego County. Eur J Epidemiol. 2010;25(3):211-7. doi: 10.1007/s10654-009-9420-1. [PubMed: 20084430]. [PubMed Central: PMC2836467]. 6. Lim SS, Vos T, Flaxman AD, Danaei G, Shibuya K, Adair-Rohani H, et al. A comparative risk assessment of burden of disease and injury attributable to 67 risk factors and risk factor clusters in 21 regions, 1990-2010: A systematic analysis for the Global Burden of Disease Study 2010. Lancet. 2012;380(9859):2224-60. doi: 10.1016/S0140-6736(12)61766-8. [PubMed: 23245609]. [PubMed Central: PMC4156511]. 7. Sadegh Tabrizi J, Sadeghi Bazargani H, Mohammadi R, Saadati M. Iranian designated safe communities: A quantitative analysis. Trauma Mon. 2017;In Press(In Press). doi: 10.5812/traumamon.59247. 8. Peden M. World report on child injury prevention appeals to "keep kids safe". Inj Prev. 2008;14(6):413-4. doi: 10.1136/ip.2008.020693. [PubMed: 19074252]. 9. Paulson Jerome A, Gitterman Benjamin A. Children's health and the environment: World Health Organization. Saunders; 2007. 10. Pickett W, Nichol M, Ehiri JE. Unintentional injuries in children. In: Ehiri J, editor. Maternal child health. Boston, MA: Springer; 2009. 11. McCarthy ML, Serpi T, Kufera JA, Demeter LA, Paidas C. Factors influencing admission among children with a traumatic brain injury. Acad Emerg Med. 2002;9(7):684-93. [PubMed: 12093708]. 12. Esmaeili Z, Vaez Zadeh N. [To study the accidents patterns in children under 15 years of age met with an accident in Mazandaran province in 78-79]. J Mazandaran Univ Med Sci. 2000;10(29):1-7. Persian. 13. 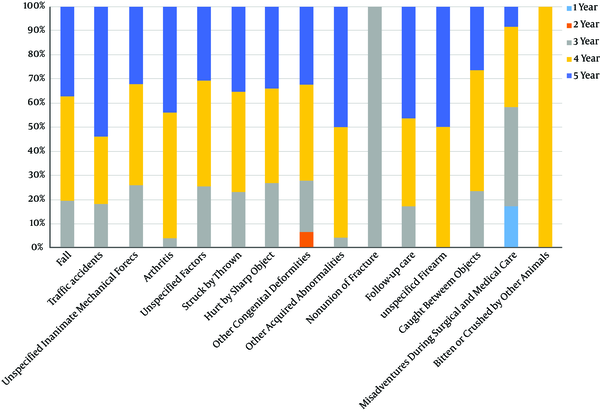 Sadeghi Bazargani H, Saadati M, Rezapour R, Abedi L. Determinants and barriers of helmet use in Iranian motorcyclists: A systematic review. J Inj Violence Res. 2017;9(1). doi: 10.5249/jivr.v9i1.890. [PubMed: 28042961]. [PubMed Central: PMC5279993]. 14. Khodadadi H, Asadpoor M, Zohrehkermani S, Ravari A. [Frequency of injuries in children under 15 years admitted to the emergency Hospital of Imam Ali Ibn Abi Talib (AS) in Rafsanjan 1999-2000]. J Rafsanjan Univ Med Sci. 2007;5(3):201-8. Persian. 15. Jamshidbeygi E, Rastad H, Qorbani M, Saadat S, Sepidarkish M, Asayesh H, et al. National and sub-national trend and burden of injuries in Iran, 1990 - 2013: A study protocol. Arch Iran Med. 2014;17(3):138-45. [PubMed: 24621356]. 16. Dolatabadi AA, Mohseninia N, Amiri M, Motamed H, Halimi Asl A. Pediatric trauma patients in Imam Hossein emergency department; An epidemiologic study. Iran j emerg med. 2016;3(1):4-8. 17. Ganveer GB, Tiwari RR. Injury pattern among non-fatal road traffic accident cases: A cross-sectional study in Central India. Indian J Med Sci. 2005;59(1):9-12. doi: 10.4103/0019-5359.13812. [PubMed: 15681886]. 18. Mobasheri F, Azizi A, Rastbaf F. [The epidemiological pattern of injuries among children under 15 years of age in Fasa in 2013]. J Fasa Univ Med Sci. 2016;6(1):69-78. Persian. 19. Rivara FP, Thompson DC, Thompson RS. Epidemiology of bicycle injuries and risk factors for serious injury. 1997. Inj Prev. 2015;21(1):47-51. doi: 10.1136/injprev-00002-0038rep. [PubMed: 25609752]. 20. Asadi P, Asadi K, Rimaz S, Monsef-Kasmaie V, Zohrevandi B, Mohtasham-Amiri Z. 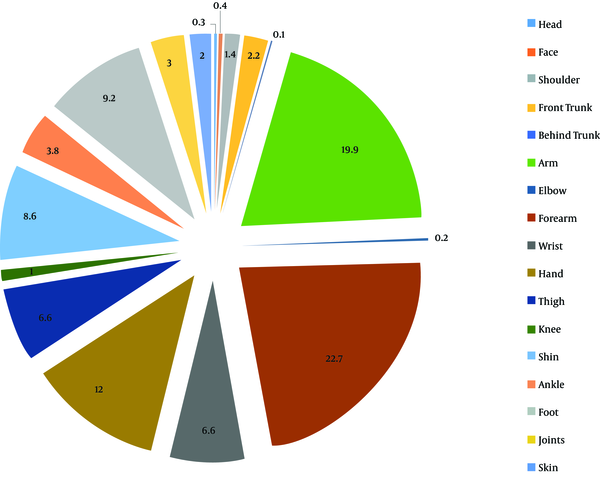 [Epidemiology of trauma in children admitted to Poursina Teaching Hospital]. J Guilan Univ Med Sci. 2015;23(92):9-15. Persian. 21. Kelishadi R, Qorbani M, Motlagh ME, Ardalan G, Moafi M, Mahmood-Arabi M, et al. 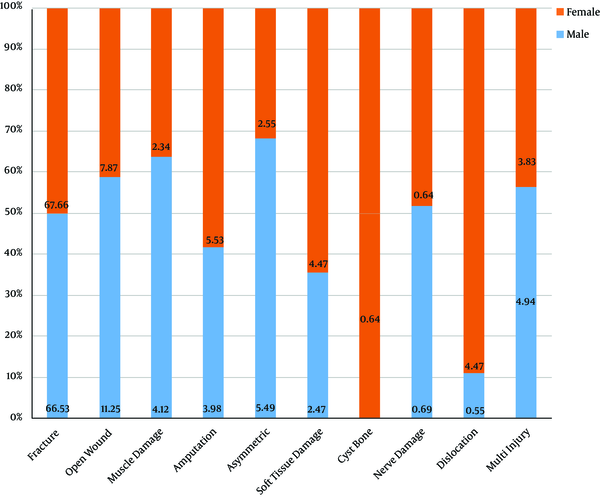 Frequency, causes, and places of unintentional injuries in a nationally representative sample of Iranian children and adolescents: The CASPIAN-IV study. Int J Prev Med. 2014;5(10):1224-30. [PubMed: 25400879]. [PubMed Central: PMC4223940]. 22. Schwebel DC, Gaines J. Pediatric unintentional injury: Behavioral risk factors and implications for prevention. J Dev Behav Pediatr. 2007;28(3):245-54. doi: 10.1097/01.DBP.0000268561.80204.2a. [PubMed: 17565295]. 23. Singer MS, Ghaffar A. Risk factors for injury in Pakistani children. Biosci Trends. 2008;2(1):10-4. [PubMed: 20103893]. 24. Baez-Baez GL, Orozco-Valerio MJ, Davalos-Guzman JC, Mendez-Magana AC, Celis A. [Drowning mortality trends in children younger than 5 years old in Mexico, 1979-2008]. Revista investig clin. 2012;64(6):529-34. Spanish. 25. Fatmi Z, Kazi A, Hadden WC, Bhutta ZA, Razzak JA, Pappas G. Incidence and pattern of unintentional injuries and resulting disability among children under 5 years of age: Results of the National Health Survey of Pakistan. Paediatr Perinat Epidemiol. 2009;23(3):229-38. doi: 10.1111/j.1365-3016.2009.01024.x. [PubMed: 19775384]. 26. Jalalvandi F, Arasteh P, Safari Faramani R, Esmaeilivand M. Epidemiology of pediatric trauma and its patterns in Western Iran: A hospital based experience. Glob J Health Sci. 2015;8(6):139-46. doi: 10.5539/gjhs.v8n6p139. [PubMed: 26755468]. [PubMed Central: PMC4954915]. 27. Lawoyin TO, Lawoyin DO, Lawoyin JO. Factors associated with oro-facial injuries among children in Al-Baha, Saudi Arabia. Afr J Med Med Sci. 2002;31(1):37-40. [PubMed: 12518927].